the local church in Northern Ireland in peacemaking. The booklet and videos for each week are free to download below. The Church has a role to play in cultivating a flourishing and peaceful society for everyone. Central to this vision is the life-changing message of the Gospel of Jesus Christ reconciling God to humanity, to each other, and the whole of creation. Our message is prophetic and disturbingly simple – Be Reconciled. 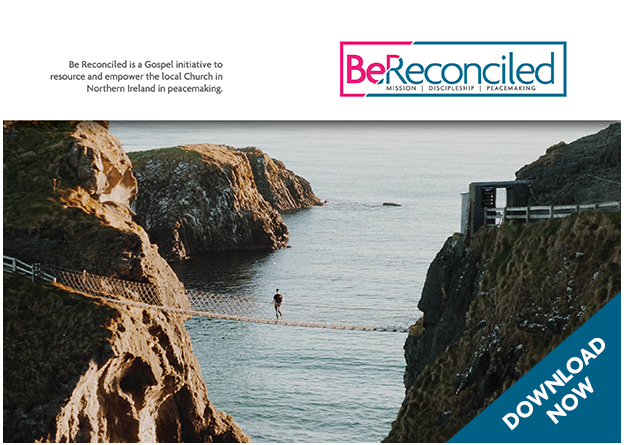 Be Reconciled is a Gospel initiative to resource and empower the local Church in Northern Ireland in peacemaking. It is a contextual response to our troubled communities centred on the reconciling message of the Gospel. At the heart of the Gospel is a gift of reconciliation with God through Jesus Christ. For those who accept this gift, there is a responsibility to live in new and reconciled relationships, not only with God, but also with their neighbours and even their enemies. The Church in Northern Ireland must give context to the Gospel by playing its part in societal healing. In a culture emerging from conflict, death, and broken relationships, the local church points to the life changing message of the Gospel. It’s a message of peace, life, and a new relationship with God and others enabled and empowered by the Holy Spirit. Reconciliation is one of the biggest moral and social justice issues facing Northern Ireland today. In this part of the world, religion has often been unhelpfully conflated with politics. Sadly this has turned some people from Jesus. The heart of Be Reconciled is missional - Christians reclaiming their radical message and radical love for God, all people, and this place. Reconciliation has increasingly become a contentious and politically loaded term. Be Reconciled is an attempt to give language, shape, and expression to a public theology of peacemaking. It is a Two-Corinthians-Five movement of Christ’s ambassadors loyal to His Kingdom above all else. It is a reclaiming of the Biblical understanding of reconciliation that, if realised fully, could help enable greater social transformation. Churches will continue to respond to this issue in the public sphere; this is proper and important. Be Reconciled is a complementary and pro-active initiative. It spans the denominations at the grassroots. It’s about helping local Churches to become local peacemakers. The resource can be used by anyone but has been developed primarily with an evangelical audience in mind who may be nervous that peacemaking in Northern Ireland means ignoring important doctrinal differences between the Catholic and Protestant Churches. This is not the case and this resource is not a call for theological union - it's about living well together amidst our genuine differences, on the common ground we share as neighbours and friends. the Holy Spirit and then to respond to God. to understand their present context. into their community and call others to reconciliation with and through Jesus. There is one video to download for each session and the questions are included on the screen for the leader to pause and discuss after each contribution. Through six weeks of small group study this resource aims to inspire and equip the local church in peacemaking. It helps us to consider reconciliation more centrally as part of our witness, mission, and discipleship. Be Reconciled can be run with a church leadership team or as a small group resource within your local church. Each week the course follows a similar pattern of reading scripture, prayer and discussion. Each week short videos from local trusted Church leaders from across the denominations will guide the group along. The course is written in a simple and accessible way. It is designed so that anyone can lead the discussion. We are really keen to start a conversation, please get in touch to find out more or to give us any feedback if you have run the course. Be Reconciled was created by local Minister Catherine Simpson and developed in partnership with Evangelical Alliance NI, with support from leading figures from across the denominations.